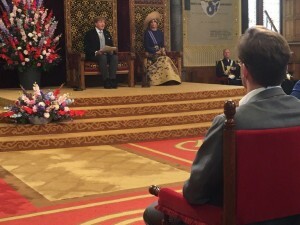 THE HAGUE - While the Netherlands is facing many challenges at this time, the financial crisis is behind us and the country is doing better, King Willem-Alexander said in his fourth Budget Day speech from the throne in the Ridderzaal on Tuesday. “Unrest and unease are hallmarks of our time. We must seize the opportunities that the future offers us”, the King said, according to the Volkskrant’s live blog on Budget Day 2016. According to the King, the Netherlands again has to cope with international setbacks, such as Britain’s decision to leave the EU. “The Brexit will cost jobs, also in our country.” But he pointed out that this is not the first time the Netherlands has to find solutions for threatening developments. Like in the past, perseverance, hard work, and entrepreneurial spirit will lead to positive results. The King is moderately optimistic about the state of unemployment in the Netherlands. The number of young people with jobs is at its highest in seven years. And more people are participating in the labor market. But as a result, unemployment is falling slower than hoped. Willem-Alexander also addressed the terrorism threat in Europe, listing attacks in Paris, Brussels and Turkey. According to him, the Dutch government continues to invest in improving safety. He stressed that democratic values must not be threatened by terrorism and added that the government is working on eliminating the breeding ground for radicalization. “The Netherlands is a strong country in an unstable world”, the Dutch King said. He added that international threats should not be underestimated, but “lasting progress is possible”.